Dondorf's "Fynste Java Speelkaarten No.17" was published to commemorate the second marriage of King William III with Princess Emma of Waldeck-Pyrmont, on January 7, 1879. 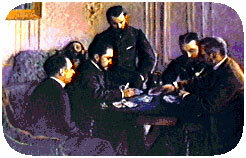 William Kimberley applied for a patent in respect of his improved playing cards in February 1892 and his application was fully accepted that year. The Knavery of the Rump playing cards, first published in 1679, are a satirical portrayal of Oliver Cromwell's Government. The illustrations on the cards provide a rare visual impression of the times.